1.140 persons from 42 countries responded the online-survey. The biggest parts of the respondents were from Germany (422 answers), followed by people from France (129) and the UK (127). The majority of respondents were individual researchers (37.6 %). The remainder were citizens (27.5 %), university/ research institutes (8.4 %), libraries (7.3 %), publishers (6.4 %), international organisations (4.3 %), research funding organisations (1 %) and national, regional or local governments (0.8 %). and insufficient national/regional strategies/policies (79 %). 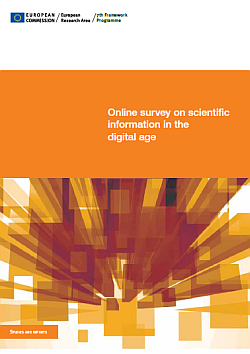 Almost 90 % of responses had the opinion that research data that is publicly available and results from public funding have to be, as a matter of principle, available for reuse and free of charge on the Internet. “The results of publicly funded research should be circulated as widely as possible as a matter of principle. The broad dissemination of knowledge, within the European Research Area and beyond, is a key driver of progress in research and innovation, and thus for jobs and growth in Europe. Our vision is Open Access to scientific information so that all of us benefit as much as possible from investments in science. To accelerate scientific progress, but also for education, for innovation and for other creative re-use. For the same reason we must preserve scientific records for future generations”. With this vision, Europe seems to be on a good way. Many thanks to Heinz Pampel (blog post in German) for spreading the news!